Swirls and Twirls - Designs for You, Your Home and Your Child! Hello, and thanks for visiting our site! We are SWIRLS AND TWIRLS ~ the Murphy Girls~ A mother and daughter team, dedicated to sharing our love for the Lord and the artistic talent God has given us, with you! Now, Why Swirls and Twirls, you ask? Well, I suppose you'll see a swirl or a twirl or two in everything we do ~ so much so, it seems to have become our signature!!! We just love swirls and twirls and hope you will too!!! To read more about the mother~daughter design team of Swirls and Twirls, please go here. You can find us at eBay! Simply go here to view any Swirls and Twirls current auction listings! Want to know when we put up new listings? Please take a second to subscribe to our E-mail List! When new auctions are placed our list members get first notice!! Stroll through our Art Gallery from the comforts of your home! Our gallery is a varied sampling of previous artwork. 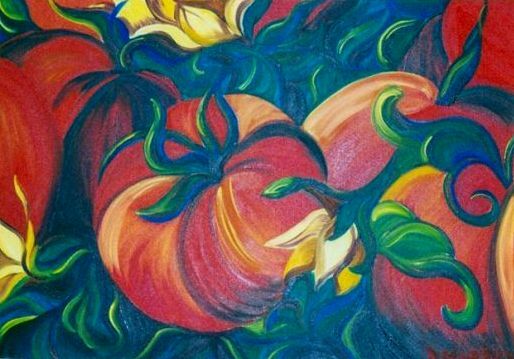 Walk the narrow pathway of an illustriously painted door mural, linger amidst the floral motifs or savor the flavor of vegetable paintings ripe with color and depth. What is right for you? Your home? Let us know and we can create it for you! Wearable Art on Denim! Who can resist? The Swirls and Twirls designers find expression in a medley of palettes. Their most recent canvas of choice is children's denim clothing items. Painted designs come alive against the endless tones and textures of denim! Why denim? Well, it has proven to be the perfect choice in children's painted clothing as it is both easy to care for and can be worn across seasons! Come see our previous painted clothing designs! Remember ... we specialize in custom designs! And that isn't all!! In addition to wall murals, floral and vegetable paintings, painted clothing and our custom design option, Swirls and Twirls also offers Wood Art cut-outs and Beaded Jewelry! What child can resist a life-size, painted, wooden cut-out of themselves? What mother doesn't need to do a little personal shopping from time to time ... for herself, a sister, a daughter or a friend? We are just so excited to have you visit our studio! May your senses be stimulated, may your spirits be lifted, may a smile break free ... enjoy your time with us! Swirls and Twirls Creative Designs © 2004, 2005. 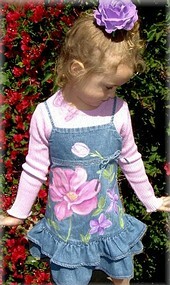 All of Swirls and Twirls’ designs are originals and protected as intellectual property by copyright law. These rights are exclusive, which means Swirls and Twirls ONLY has exclusive rights to the reproduction of its creative designs. Go here for more information on copyright law. © Swirls and Twirls, 2004, 2005. All Rights Reserved. Professional website maintenance by Very Commerce.